Mom, the Intern: Pics of the past. Do you ever start going through your pictures folder on your computer and find a bunch of pictures you'd almost forgotten about? I do. All the time. It's so fun to be able to "ooh" and "aah" over cute babies of yore, reminisce about special occasions and laugh hysterically over funny memories. Here are some I dug out of yester-year. Enjoy! Me a few days before my wedding while we were having our "groomals" done. 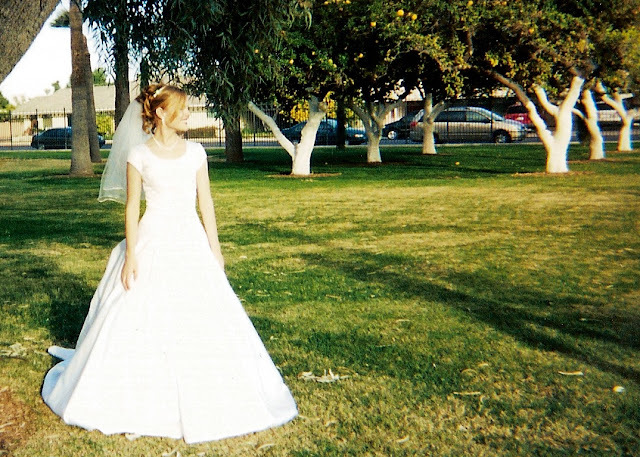 My mom took it with a disposable camera. Awesome, huh? It's all super-cool-vintage now. I have naturally-massive hair. One day, in 2006, I was getting ready for bed and took my hair out of an updo and this was the result. I was clearly made for the '80's. Around the same time as the big hair picture, I was working at a print shop on campus and made Dill a Yoda shirt. He's a huge Star Wars nerd. He still has it and wears it to play church basketball sometimes. By the way, WOW. My husband is handsome. 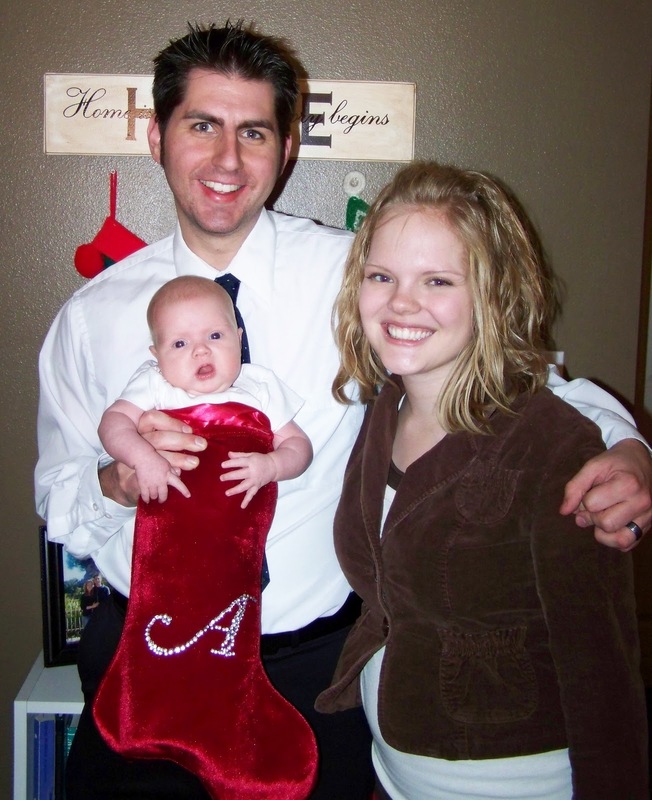 One time, we thought it would be hi-freaking-larious to put our baby in her Christmas stocking. It was a little snug, but she fit! Dill's cousin Liz took the picture and said, "It's like a tight dress!" Poor Bubby. Never mind the horrible '90's teal carpet -- the real laugh factor is Bubby's pose. She was learning to walk and had gotten stuck in a precarious place. Of course, I had to snap a picture before saving her life. Mom of the Year, you know. A tender moment between my two littles. (One, two , three:) Awwwww! We like to have fun at our kids' expense. 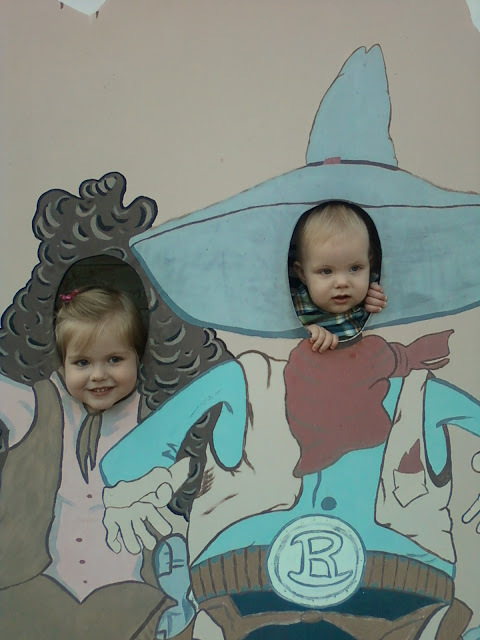 Locals will know this is at Rockin' R Ranch in Mesa. i am constantly going though old pictures! especially of my kids! and while doing so one time i figured out that my oldest makes the same crying face now as she did when she was a baby. love the yoda shirt...and the cutesy yoda babies...so sweet!